In winter, guava is very beneficial for health. It is not only beneficial for health but also for skin. Guava has high amount of vitamin C. It has four times more than citric acid compared to orange. It is beneficial for beauty and health. The daily consumption of guava balances the blood pressure. It avoids wrinkles and maintains your beauty. Guava is beneficial in constipation or digestion problem. It improves your digestion and avoids stomach problem. The daily consumption of guava controls the sugar in blood. Guava is full of fiber that helps to digest the sugar in the body. It also increases insulin level in the body. 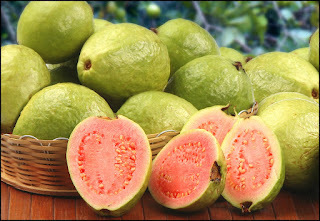 Guava is beneficial in obesity and cholesterol. It gives plenty of energy and reduces cholesterol level. Guava is beneficial in thyroid problem. It balances the hormone level and beneficial in thyroid gland problem. Guava is beneficial to increase beauty on the face. The daily consumption of guava gives natural glow. Guava is beneficial to reduce alcohol effect. One should eat to reduce the alcohol effect.